Aerial Lines sock pattern is my second pattern so far. As I’ve said before, I enjoy making up my own designs and want to do more of it! 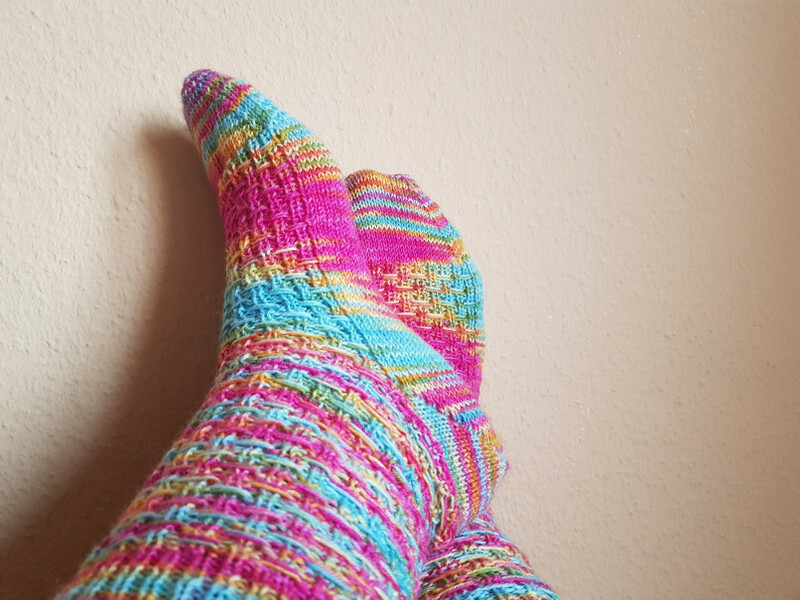 But this one didn’t come from a conscious decision of “I want to design a sock pattern.” It kind of just happened. I’ve been slowly working on cataloging my stash over the last year. It’s extensive; photographing everything and writing down what it is, takes a long time. And I still want to get it all added to Ravelry as well. But while I was doing that, I saw all those beautiful hand-dyed, variegated skeins of sock yarn. They made me start growing my stash, so I have a lot of those. Unfortunately, it’s not always easy to find a sock pattern for them. Especially not, if you’re like me and get bored quickly. I need variety in my knitting. There is only so much I can knit of a particular pattern. And plain stockinette or ribbing don’t usually hold my interest long enough so that I would be able to finish a pair of socks. (For some reason that’s less of a problem when I’m knitting sweaters; I have yet to figure out why.) Heavily variegated yarns tend to hide many stitch patterns. But I absolutely had to cast on something with some of that cheerful, bright yarn. So what to do? Close up. I just love to watch the colors combine! Then I remembered that I had recently found an intriguing stitch pattern with slipped stitches that would leave strands of yarn open on the front and was otherwise just ribbing. That sounded like a good option, so I tried it out on some variegated yarn leftovers I had lying around. I loved the result. 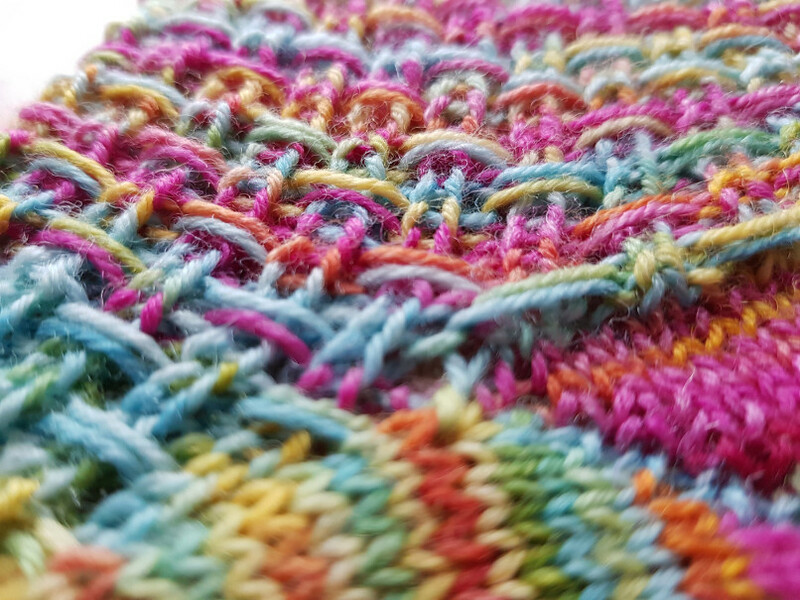 The fabric was stretchy, thanks to the ribbing in between the slipped stitches, and the stitch pattern added to the yarn and distributed its colors in fun and exciting ways. All that was left was trying to figure out how to knit a sock with it and how different sizes would work out. And the heel. I knew I wanted a short row heel for this sock. 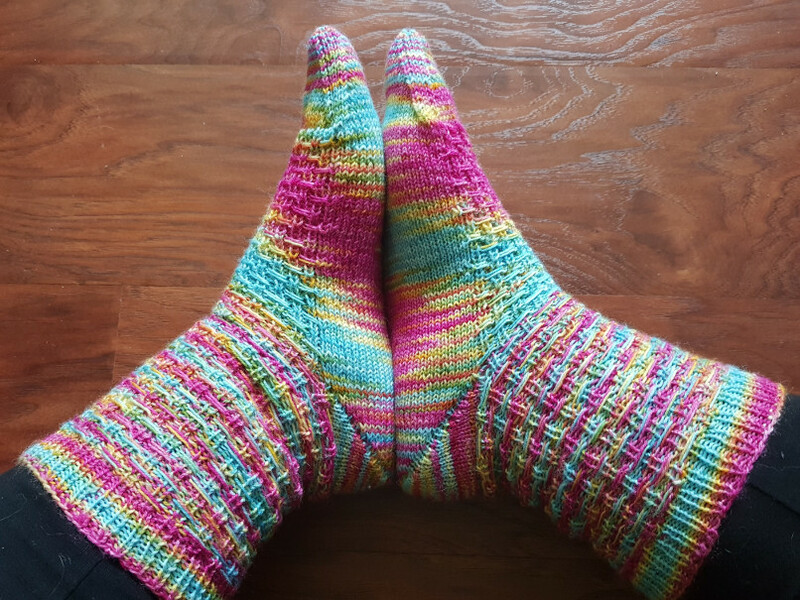 I like how they fit and how they look with variegated, self-striping or gradient yarns. (For socks with intricate lace or cable patterns, I prefer heel flaps, though.) But it took me a while to find a technique I liked. In the end, I settled on a German short row heel. The stitch pattern, with the columns of knits in between purls and strands stretching out between those columns over a field of slipped stitches, reminded me of electrical lines hanging between poles. I don’t see them that often. There are some in Hamburg but mostly in other parts of it. (I suspect they might not be allowed that close to the airport?) But we sometimes drive by them, and on a long train ride earlier this year I saw a whole lot of them. 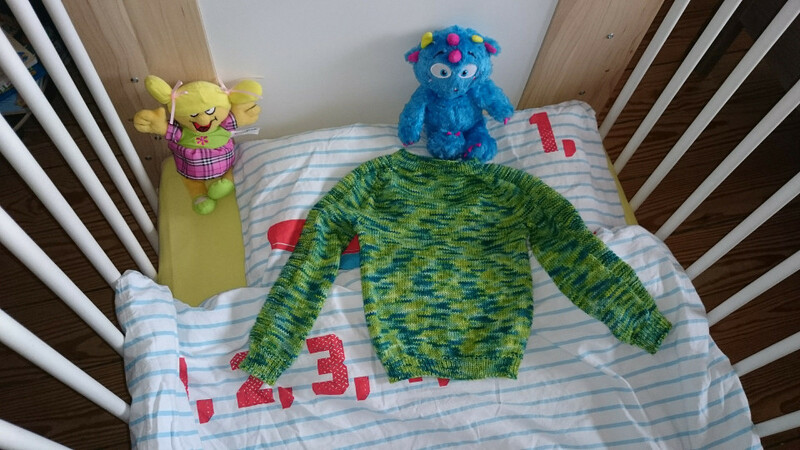 They just looked like the stitch pattern – or the stitch pattern like them. Once I had made that association in my head, I couldn’t get it out again and so I named these socks Aerial Lines. 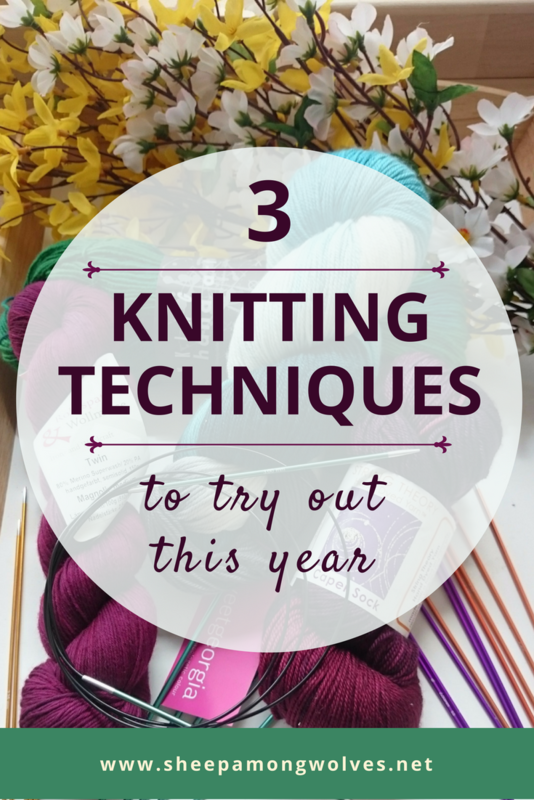 The stitch pattern itself is pretty straightforward – just knits, purls, and slipped stitches. As long as you don’t pull the strands too tight (the fabric shouldn’t pucker up) you are fine. The short row heel might seem a bit more advanced, but the technique is surprisingly simple and quick to pick up with a good video or two (I’ve included links in the pattern). So, I would classify this pattern’s difficulty as “experienced beginner” to “intermediate”. 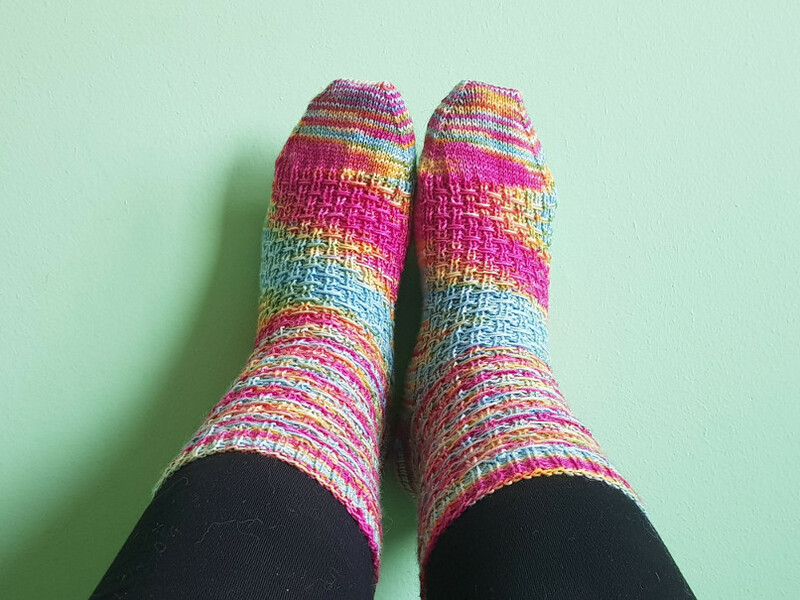 If you’ve knit a sock before (and it didn’t turn out to be a weird shape but fit the receiving foot), you should be able to make these. And the best thing (for you): it’s free! Just go to Ravelry and download it! If you want, drop me a line either here in the comments or through the contact form. Let me know how you like this pattern. Or what you would like me to write about in the future. Or whatever comes to your mind! I love to hear from you!